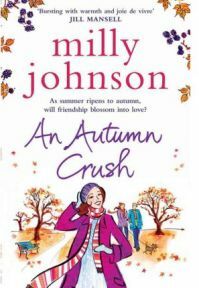 I’m not quite sure why I have not read any of Milly Johnson’s books before, as she is definitely my kind of author, but when I picked up An Autumn Crush, it was the first I had read. I was not too sure what to expect as the title sounds a bit light and airy, but as soon as I started reading I knew that I was going to enjoy it and it was also going to be a bit more thought provoking than the title would suggest. Having read this book though, I will definitely start reading more from Milly Johnson. I had noticed that Milly Johnson’s last book was called ‘A Summer Fling’ so I was slightly concerned that An Autumn Crush might be a sequel and that I would be reading them in the wrong order. However, that is not the case as An Autumn Crush seems to feature an entirely different set of characters. Milly Johnson comes from Barnsley and this is where An Autumn Crush is set too. I found it quite refreshing that it wasn’t set in such a glamorous location as many books – not that I’m knocking Barnsley! It just seems to be a good idea to set a story in an area that one knows. The story is about two thirty-something house mates, Juliet and Floz. Newly divorced Juliet needs someone to share her home and her living costs, so after interviewing many possible tenants with her friend Coco, Floz Cherrydale is the one she feels is most suited. Floz soon moves in and the women become firm friends. However, the one thing that is lacking in both of their lives seems to be love. Juliet tries a few disastrous attempts at internet dating and Floz is conducting a fated email romance with a Canadian who she has never met. What they don’t seem to realise though is that romance could be staring them in the face in the shape of Juliet’s twin brother, Guy, and his best friend Steve. Of course, things are never that straightforward – Guy is always clumsy and awkward around Floz, leading her to the conclusion that he does not like her, and Juliet has always hated Steve ever since they were at school together. So the question is whether or not either potential couple will actually get it together. The reader is never quite sure up to the very end. I really enjoyed An Autumn Crush and I loved Milly Johnson’s easy style of writing. She tells a good story and creates some wonderfully likeable characters who seem very real. There is a great deal of humour in the book but it is quite moving too and there were some moments that found me close to tears. It is the sort of book that you just want to keep on reading and I felt quite disappointed when it was over. Maybe Milly Johnson might be tempted to write a sequel! With thanks to Simon & Schuster for sending a review copy. No Comments on "An Autumn Crush"